Are you looking to get active, meet some new people, get involved in your community? 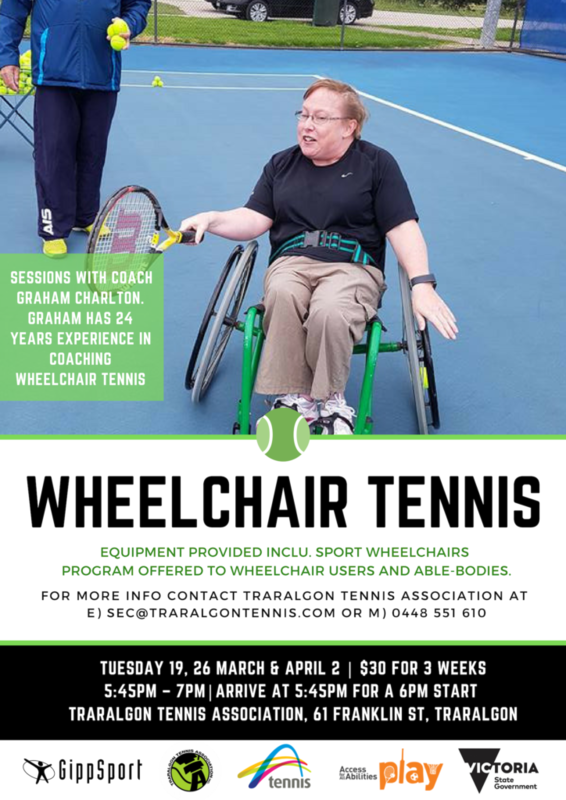 Come and try Wheelchair tennis at the Traralgon Tennis Association! This program focuses on some of the fundamentals of the movement patterns around the game of wheelchair tennis, the tactics of wheelchair tennis and the technique of playing in a chair. This entry was posted in News on February 21, 2019 by Nicole Osbourne. 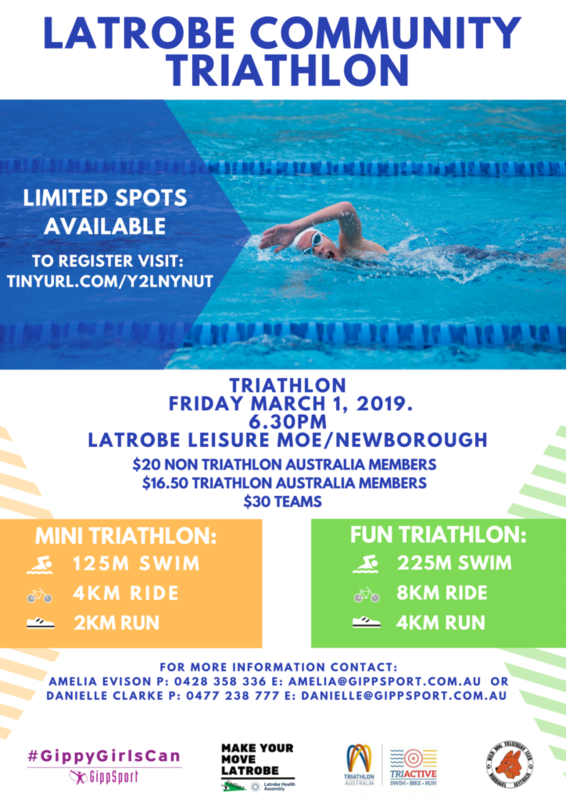 The Make Your Move Latrobe & Gippy Girls Can Community Triathlon will run Friday night March 1 2019 at the Latrobe Leisure Centre Moe Newborough. Welcoming all members of the community interested in participating in triathlon, the race will see the swim done in the pool before heading to the velodrome for bike and athletics track for run. Teenagers from 13 to 17 can race in the shorter distance. – Race start is 630pm (first “wave” sets off). You will be advised your “start wave and start time” at check-in on race day. – Race briefing is 615pm; which all participants should attend. The location will be advised at check-in. – Check-in opens at 5pm and closes 545pm. – Transition opens 5pm and closes 6pm. This entry was posted in News on February 15, 2019 by Nicole Osbourne. Dose your club have a Hot Weather policy? Vicsport has developed a Hot Weather policy template for sporting clubs and associations. The Vicsport Hot Water Policy Template is designed for sport organisations to develop a policy template to promote the safety of all participants during hot weather. Vicsport reminds organisations that the information contained within this document is general in nature and should not be considered as a substitute for legal advice. This entry was posted in News on February 4, 2019 by Nicole Osbourne. Looking to give a triathlon a go? TRIactive is a six-week beginner triathlon program that culminates in finishing a ‘mini’ triathlon. The program makes sure that no matter what your starting point is the coach and fellow participants will support your progress and make sure you cross the finish line. Triathlon is on everyone’s bucket list. It doesn’t matter if you’ve haven’t ridden since you were a kid or struggle as a swimmer or runner. TRIactive is about giving triathlon a go and having a bit of fun along the way. The first 3 Bike sessions are conducted in a spin room with the remainder on the velodrome. The swim sessions are completed in a traditional pool settings. When: Program begins 21/01/19, running until 01/03/19, and culminating in participation in local mini-triathlon on Friday March 1, 2019. Contact: For further enquiries around the TRIactive GippSport program, please contact Danielle Clarke at danielle@gippsport.com.au. For general enquiries about TRIactive, please contact the Triathlon Victoria office on (03) 9598 8686. When: Program begins 23/01/19, running until 01/03/19, and culminating in participation in local mini-triathlon on Friday March 1, 2019. Contact: For further enquiries around the TRIactive GippSport program, please contact Amelia Evison at amelia@gippsport.com.au. For general enquiries about TRIactive, please contact the Triathlon Victoria office on (03) 9598 8686. This entry was posted in News on January 22, 2019 by Nicole Osbourne. New to a Committee or a first time President, Secretary or Treasurer? GippSport has the workshop for you! This entry was posted in News on November 8, 2018 by Nicole Osbourne. The “Changing Gippsland’s Game- Girls in Sport Forum” was a facilitated workshop for girls aged 14-17 to start their journey on becoming the next generation of female leaders, and help GippSport work with the Gippsland sport sector to be more welcoming, inclusive and supportive for women & girls. GippSport invited 50 young aspiring female change makers from across Gippsland to attend the one-day forum which was held on October 2, 2018 at The Summit in Trafalgar. 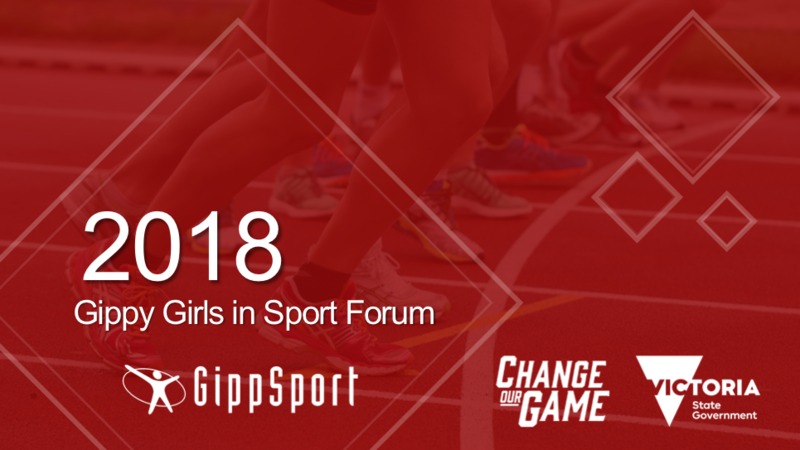 The forum, hosted by GippSport, was funded by the Victorian Government’s Office for Women in Sport & Recreation to empower Gippsland girls to share their experiences and co-design with GippSport. The day offered opportunities for girls in their age range to increase participation in sport and recreation within the Gippsland community. Our guest speaker for the day was Change Our Game Ambassador, Lauren Foote who provided inspirational advice to the young aspiring female change makers. “I’m really proud to be a Change Our Game Ambassador. It means a great deal to me that young girls have someone to look up to. When I was a kid you didn’t really dream of being a female athlete because that wasn’t a job title that was up for grabs.” said Ms Foote. GippSport also engaged Dr Erica Randle, Research Fellow at Latrobe University Centre of Sport & Social Impact, to facilitate the day. Dr Randle is leading Sport Australia’s Youth Participation Research project and facilitated the session to help GippSport better understand our community’s needs and empowering the participants to design solutions that can help Gippsland. We had an awesome day, filled with social sport activities and a number of workshop sessions. Each of the girls were given a Gippy Girls Can T-Shirt which they were able to wear when they tackled the 3km Monster Obstacle course in teams. Information collected at the session will be developed into a report, case studies as well as practical resources for sports clubs to use when designing new programs to cater for the age group. 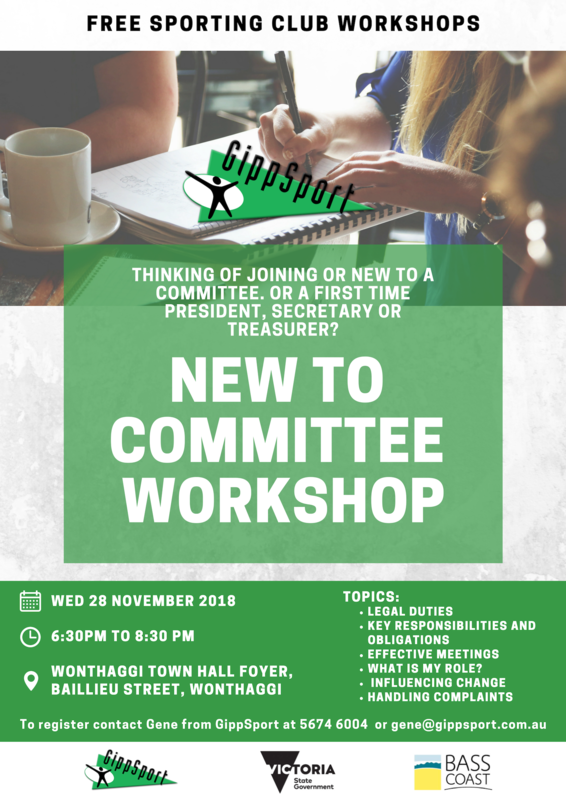 We are also excited that a number of our young changemakers are keen to partner with GippSport in the coming months to implement some new initiatives and help spread the word amongst their peer group. This entry was posted in News on October 8, 2018 by Nicole Osbourne.